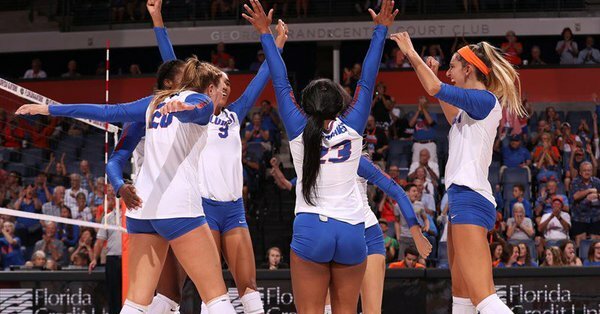 ORLANDO, Fla. – The Florida Gators defeated the Florida State Seminoles in straight-sets during the first round of the NCAA Tournament on Thursday night. The Gators were led offensively by Paige Hammons, who posted 16 kills during the match, one short of her career high. Rachael Kramer and Thayer Hall followed with nine kills apiece, while Taelor Kellum posted seven. Florida held an 11-5 advantage early in the first set, forcing Florida State to use a timeout. The Gators continued to hold onto their lead, going up 19-14. FSU followed with a 4-1 run, getting to within two, but the Gators were able to close out the set on a service ace by Rachael Kramer. Florida hit .214 in the first set, recording 14 kills along the way. Paige Hammons registered five kills in the frame – hitting .500 – and Taelor Kellum and Thayer Hall both pitched in three of their own. UF found itself down 6-2 early, but the squad fought back to even it up at 7-7. From that point on, the Gators went on a 14-5 run, taking a 21-12 lead in the process. FSU battled to within four points at 23-19, but Florida secured the frame with two kills from Rachael Kramer. The Gators hit .286 in the second frame, collecting 16 kills along the way. Once again, Paige Hammons registered five kills, followed by four from both Rachael Kramer and Thayer Hall. With the third set tied 10-10, the Gators went on an 8-0 run behind the serves of Allie Gregory. FSU got within eight points at 20-12, but it was Gators the rest of the way as they closed out the set on a kill by Paige Hammons. UF hit .333 in the third and held the Seminoles to a .107 hit clip. Paige Hammons posted six kills in the frame, while Rachael Kramer and Taelor Kellum each added three. ORLANDO, Fla. – The Florida State volleyball team (19-9, 15-3 ACC) ended its season in the NCAA Tournament on Thursday night, falling to the No. 16 Florida Gators (25-6, 15-3 SEC) in the First Round. The second-seeded Gators swept three-seed Florida State at UCF’s campus site, marking Florida State’s first loss to Florida in the postseason since 2010. Junior outside hitter Payton Caffrey, the ACC Player of the Year, led FSU’s offense with 14 kills, hitting .275 in the match. The Seminoles’ defensive effort was led by senior libero Kelsey Wicinski with 14 digs, and three blocks from both redshirt senior Christina Ambrose and sophomore Taryn Knuth. The Seminoles saw their 19th straight winning season in 2018, and made the NCAA Tournament for the 10th consecutive season – making them one of only 11 teams in the nation to accomplish the feat. The team went into the postseason sitting above 30 in the RPI for the 10th straight season, and finished as one of the top two teams in the conference for the 13th time in program history. The beginning of the opening set stayed tight as both teams used smart plays to put the ball down and pick up points, but an inability to return Florida’s attacks kept the Seminoles behind on the scoreboard. FSU’s defense started clicking in the last half of the set, as the Seminoles were able to keep the ball alive and slow down Florida’s tough offense. While the Seminoles were able to hang in the set until the end, it was errors on both serving and serve receive that gave the Gators the points they needed to finish the set and take a 1-0 lead in the match. The Seminoles started off the second set strong, gaining an early lead with kills from Caffrey and Ashley Murray, and an assisted block from the pair. Attack errors and service errors highlighted the first half of the set, but a 3-0 scoring run fueled by two kills and a block helped them regain a lead that they never surrendered. While Caffrey’s seven kills in the set helped the Seminoles’ offense stay strong against Florida’s large offensive presence, a more consistent execution from the Gators’ front line helped them outhit the Seminoles and stay ahead throughout the set. The beginning of the third set stayed close, as Florida picked up more kills than the Seminoles, but also more errors. The Seminoles saw more success getting the point on scrappy rallies and didn’t pick up a single unforced hitting error, but Florida’s consistency helped them maintain the lead as they continued to outhit the Seminoles. Florida controlled nearly every point until the end of the set, going on a 10-1 run to reach 20 points, only surrendering a point on an attack error. From there, a 5-2 run from the Gators helped them close out the match and advance to the Second Round.